Dabeli is a popular snack and a famous street food from the state of Gujarat. 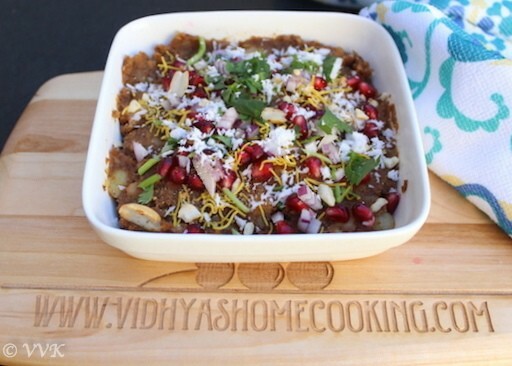 (Wiki mentions that the recipe originated in the Kutch region of Gujarat) It is the Indian burger filled with potato filling and topped up with masala peanuts, pomegranate seeds and sev. Dabeli a mixture of all different tastes and it is a yummy and a filling recipe. It is tangy, it is spicy, it is sweet, and it is pungent too because of the garlic chutney. I have never explored other cuisines when I was in India. Visiting restaurants was a luxury and even when we go out we order pretty much South Indian food. Once I started working, in that short span of one year before my parents packed me here to USA, I did explore other cuisines but not much. All my food exploration started here in US and the funny thing is I haven’t traveled beyond the South Indian States. But I am going to post all chaat recipes from different states that I have never visited before. 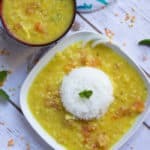 I am going to share what I learnt about these recipes and their background. Please feel free to add your comments and suggestions. 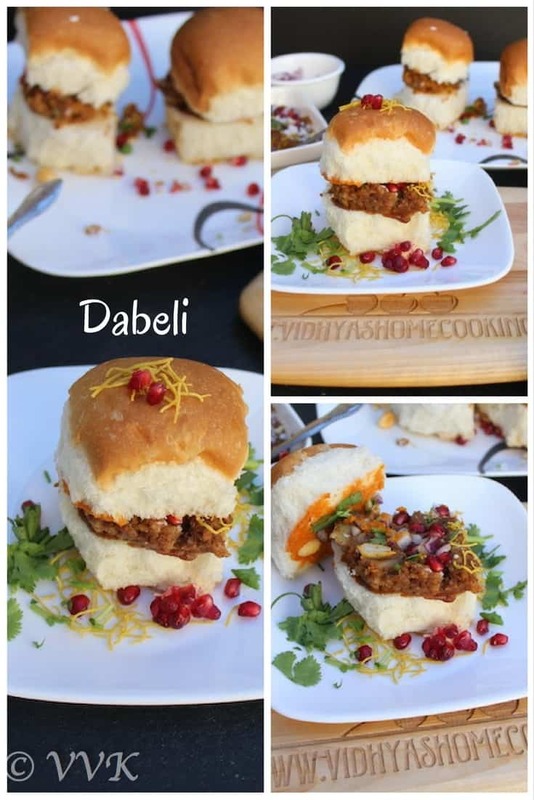 Dabeli – the chaat that I tried during my first trimester in one of the get-together potlucks. Dabeli means pressed in Gujarati and our friend took the effort of preparing everything bought them well packed and assembled the Dabeli in front of us. 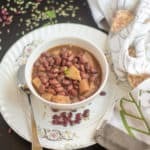 I fell in love with this recipe instantly and got the recipe right away, but didn’t try making it home until recently. 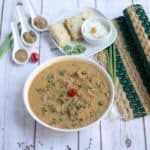 I think it was just the mental block that I had in my mind, thinking that it would take long time to prepare this recipe, was stopping me to try this at home. But believe me it doesn’t take that long at all. 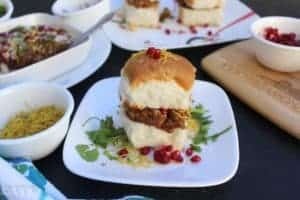 When I prepared Dabeli for the first time, I felt it was little too spicy for the kiddo, so from then on whenever I prepare this at home, I assemble it in a different way for him. I have mentioned that below too. I am not sure if I should call this as a snack. I usually prepare this dinner as it is really filling and satisfying. Grate about 2 tbsps coconut and set aside. Chop the onions and cilantro too. 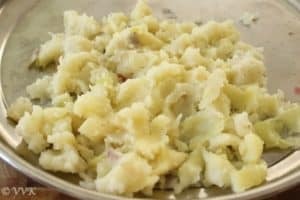 Boil the potatoes in your preferred way. I microwaved my potatoes under the potato setting. Let it cool down, peel the skin and mash the potatoes nicely. Clean the pomegranate, chop them and separate about 1/4 of arils or the edible seeds. Peel the garlic skin and grind the cloves along with red chili powder and black salt by adding 2 tbsps of water. Here is the pungent garlic chutney. You can use store bought masala peanuts also. Once the oil is hot, add about 1/4 cup of peanuts and the 1/4 tsp of red chilli powder and amchur powder. Roast in medium heat for about 3 to 4 minutes. Once it is cool, crush them in mortar pestle. Once the oil is turn to low heat and add the dabeli masala and let it roast for a minute. Make sure the heat is low if not the masala would get burned. Now add 2 tbsps of water and the dates and tamarind chutney and mix well. Let it cook for about 45 seconds and now add the mashed potatoes and salt. Mix them well and if required add 2 more tbsps of water. The filling should not be too dry. Let it cook for couple of minutes and then turn off the heat. Now add the lemon juice and mix well. 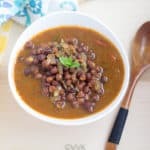 Now place this masala mix in a bowl or plate and press it well. 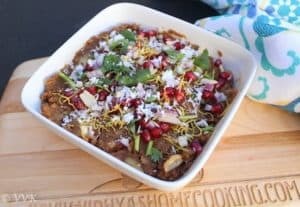 Then add all the toppings or garnishing – I added grated coconut, sev, chopped onions, cilantro, crushed peanuts and pomegranate arils. Here is the masala filling. Heat the tawa and add bit of butter or ghee or oil. Slit the pav buns and place them upside down and roast them for about 30 to 45 seconds. Now spread the garlic chutney on one side of the bun and on the other side the dates and tamarind chutney. Scoop out about 2 tbsps of potato filling and place on any one of the sides of pav bun like below. Add more garnishings as per your preference and cover it with the other side. That’s it. Indian Dabeli Sandwich is ready. Enjoy!!! I use the Hawaiian Sweet bun for the kiddo. I slit them into two and roast them slightly with butter. I skip the garlic chutney and instead add tomato ketchup and add about 1 tbsp of the potato filling and also skip the raw onions and add more sev. Adjust the spices and garnishing as per your preference. 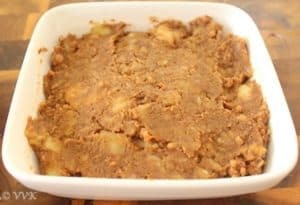 If required, sugar can be added in the potato mixture. Store bought masala peanuts can be used too. If required, add about 1/4 tsp of red chilli powder to the potato filling. Also adjust the red chilli powder as per your preference for the garlic chutney. 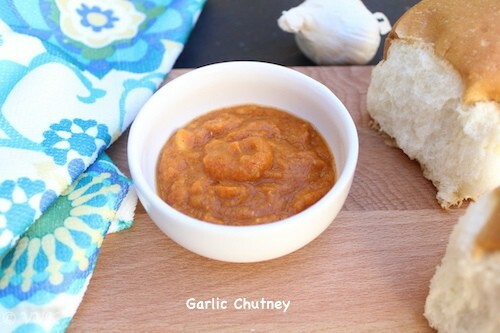 This garlic chutney can be prepared in bulk and stored for about a week. I just prepared required quantity for this recipe. Dabeli - Indian burger filled with potato filling and topped up with masala peanuts, pomegranate seeds and sev with sweet chutney and garlic chutney spread. Peel the garlic skin and grind the garlic cloves along with red chili powder and black salt by adding 2 tbsps of water. Let it cook for about 45 seconds and now add the boiled mashed potatoes and salt. Then add all the toppings or garnishing - I added grated coconut, sev, chopped onions, cilantro, crushed peanuts and pomegranate arils. That's it. Indian Dabeli Sandwich is ready. Enjoy!!! Thanks a lot Sowmya.. yeah they are very filling. Dabeli is such a delicious sandwich, isn’t it?? I loved making it too for the marathon. Lovely clicks. Neat presentation. I didnt know so many other variations existed with the ‘Pav’. I am yet to explore a lot in cooking I guess. :-) Thanks Veena.. please do make it again. Awww, that is amazing, oh my god, i want to just grab that sandwich from the picture. Literally drooling over that filling, superb!!!! We love dabeli at home. I loved your version, I am sure you all had a treat!! Dabeli looks perfect and yummy. Iam a Chaat freak and you are tempting me too much yaar. And I love your watermark on the wooden board. It had come out so well. Thanks a lot Suja. :-) Actually its engraved in the wooden board. Delicious dabeli. I tried it once in Mumbai but did not enjoy it. Maybe it was the fellow who made it. I love the way you have made it. Your dabelis look amazing and loving your recipes this week. 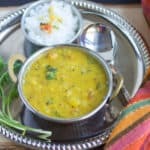 My favorite street food from Gujarat! It has been on my to-do list forever now. This is in my to do list for the longest time ever! Looks so tempting. Thanks Sandhya.. Please do try. Yummy looking dabeli,you made it so perfectly.. Even I tasted dabeli only recently. Your dabeli has come out very well and pictures are inviting. Though the process looks long, I am sure it was not as tedious as it looks. Even if it is, I am sure it is worth all the effort. 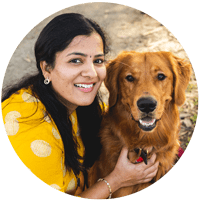 I recently made dabeli at home and even my kid loved it. 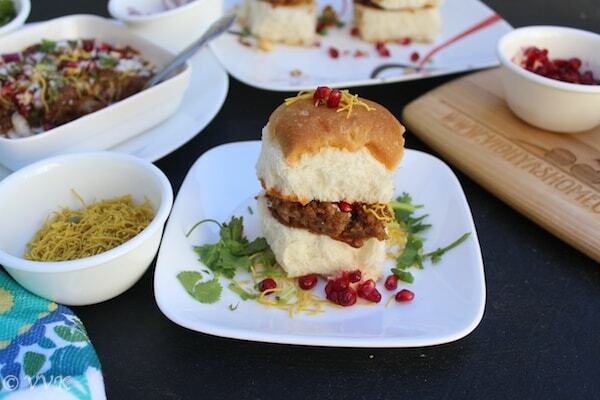 Your dabeli pav looks so yum, I am tempted to try it again.. Thanks Gayathri.. Its great meal and snack naa? Dabeli is a delicious snack from Gujrat and you have made it perfectly ! Lovely clicks . 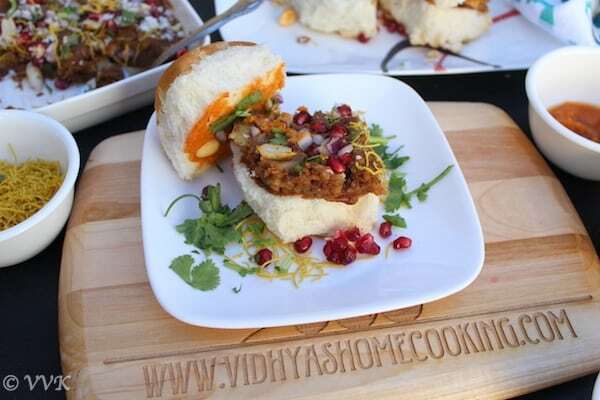 Omg, this dabeli sandwich is just inviting me Vidhya, my mouth is just watering here. And that plate of dabeli sandwich sounds prefect for me to satisfy my crave for chaat foods. Thanks a lot for those amazing words Priya. Am salivating at each step Vidhya ! Well done :)) the dabeli looks amazing !! Can I be ur 2ns “vaandu” for a day or two :))) wudnt mind someone making these treats for me ? I remember making Dabeli few yeasr back. Your post is tempting me to make it again. Such lovely dabelis Srividhya..even without having ever tasted you have come up with such delicious looking ones..food is so global now, not confined to one region and area. Being in a different space we can still explore different cuisines being right in our kitchen!..so I am sure your versions will end up being awesome..rock on! “Food is so global” – totally agree with you valli. Thanks a ton for your encouraging words.